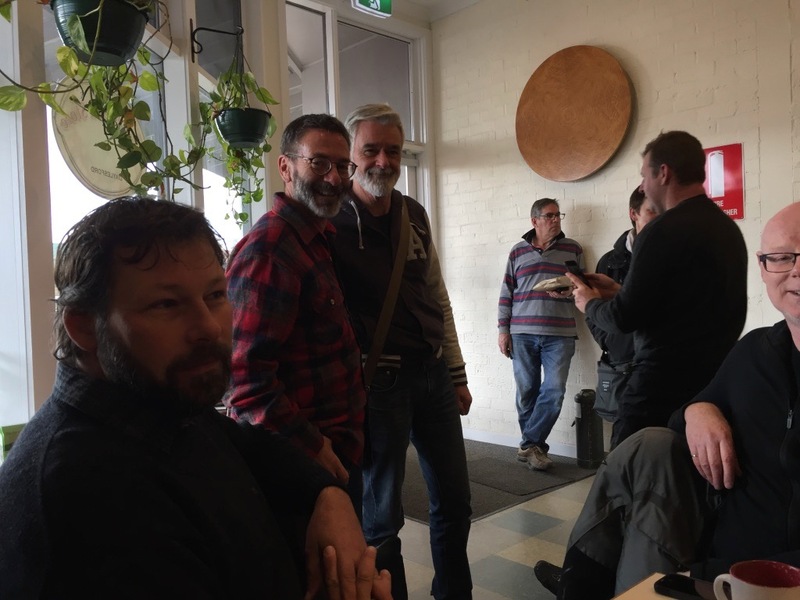 It was minus two degrees when the Marysville chapter of MMT departed at 7:30am to meet with the rest of the group in Sunbury. I allowed plenty of time to get to the other side of town not knowing what the road conditions would be like once we were off the mountain. With mostly sunny conditions and amazingly not a damp corner in sight, we made our way swiftly through the hills with the ambient temperature gauge on both the Ducati and BMW both hovering around zero for most of the way as we skirted around the outer northern areas of Melbourne before arriving at Sunbury shortly after 9am. Near freezing we took refuge in McDonalds, tightly holding on to our warm beverages while other patrons glanced over in our direction with a look of “Are you mad”. This scenario was to set the tone for what lay ahead on MMT’s very first Relay Ride! 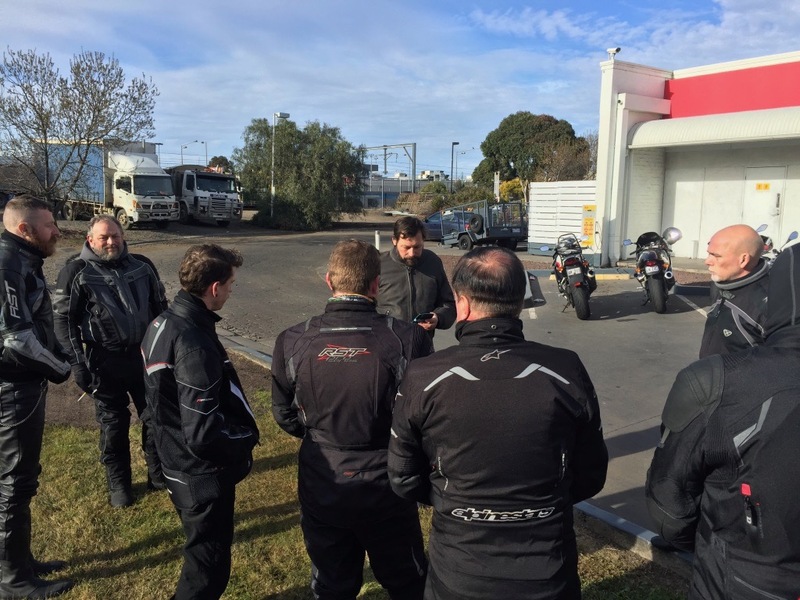 Twelve bikes gathered at the Shell Servo in Sunbury, and after a brief run down on how I thought the ride should work the group departed soon after 10am with the temperature now at six degrees. 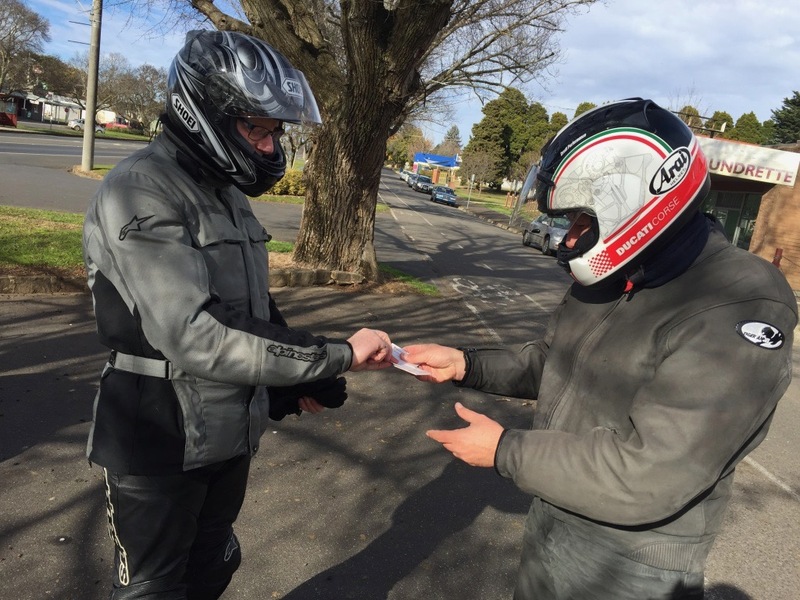 We headed back towards Melbourne and turned left onto the Lancefield Road to head north. Upon arriving at Romsey I decided to pull over and declare my resignation as ride leader. Everyone had a card with their name on it and the cards were shuffled and it was the duty of Tail Rider Tim L to choose a card held face down and declare the next ride leader. Glenn’s name was picked from the pack and after a brief discussion with other riders the VFR fired into life and continued north. We slowed at the 60km sign at Lancefield and I wondered if we would be stopping? Which direction will Glenn take us in next? It was quite exciting not knowing where we would end up. It didn’t look like Glenn was going to pull over and we turned left and were now heading west towards Woodend. We continued through Rochford and then turned left at Newham and now heading in a southerly direction, but not for long. Another left turn and we were on the Romsey Road heading back to Romsey WTF! I’m loving this, not knowing what’s going to happen next. After passing the entrance to Hanging Rock Glenn finally discovered the VFR had a right indicator (Those clever Japanese). It now looked like we would be heading to Mount Macedon, possibly for an early lunch. WRONG! Glenn was now fixated with the right indicator and we turned off the Mt Macedon Road into the Macedon Regional Park. Ah, we must be going to the Mount Macedon War Memorial Cross, it’s a clear day to get a good view over Melbourne. 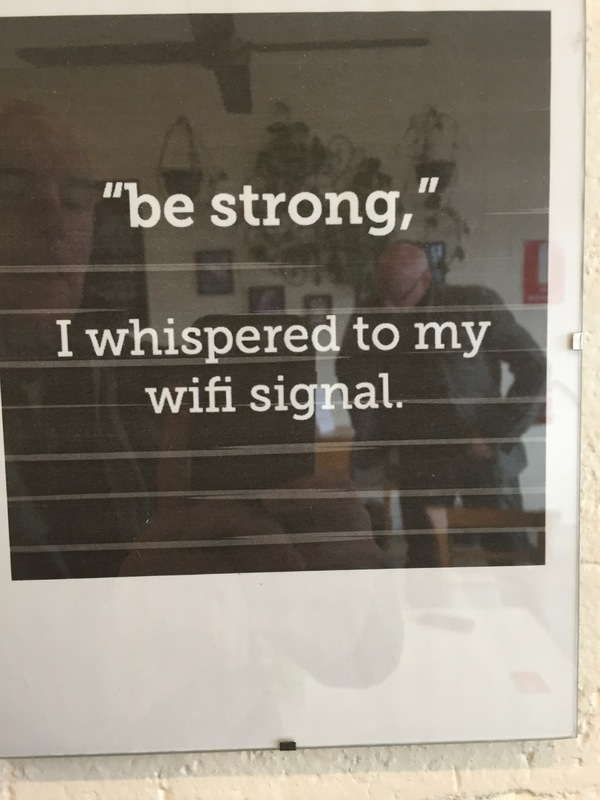 WRONG AGAIN! We arrived at the Top Of The Range car park and made a beeline for the café where Glenn announced we would be having morning tea. The café wasn’t terribly busy and the cosy environment was a welcome relief from the three degrees it was outside. Once everyone had warmed up with a hot beverage we made our way back out to the car park. 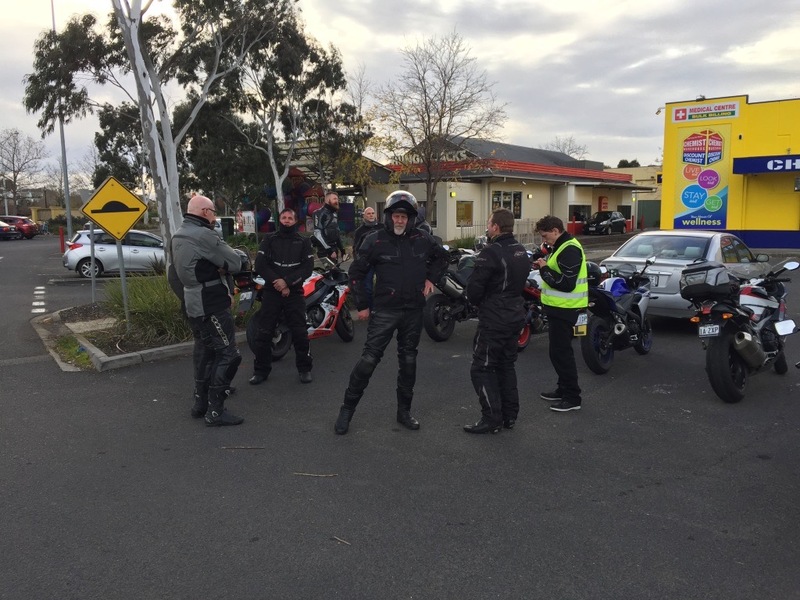 Glenn was not ready to relinquish the reins of ride leader just yet and led the group back down the mountain towards Hanging Rock and then continued west to Woodend where Glenn pulled up and declared he was no longer ride leader. Out came the cards and Tale End Tim drew one from the pack and announced that Peter Ho was now in charge as ride leader. Adz cried out “We’re in a Pete & Tim Sandwich” and then promptly found himself in one. 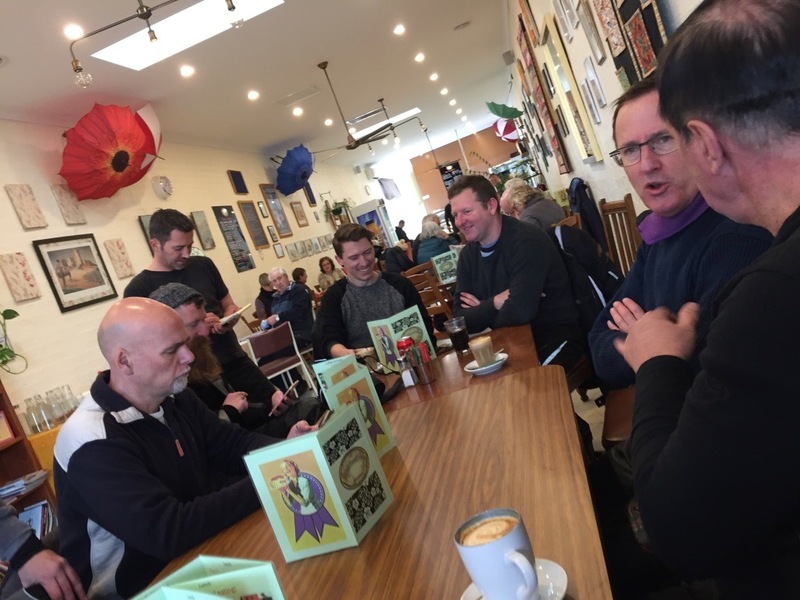 After the frivolity was over, Pete announced we would not be staying in Woodend for lunch and the group continued on in a westerly direction now being led by a BMW. 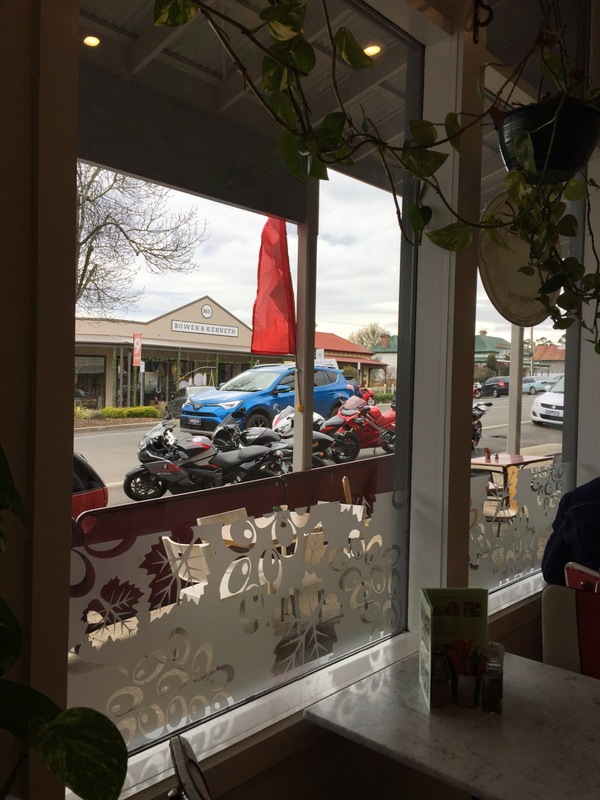 The group rode through the main street of Trentham and the freight train of bikes continued on with no sign of stopping for lunch as it was now approaching 1:30pm. Onto Bullarto & Musk and still heading west I was hoping the ride would start heading back towards Marysville soon. 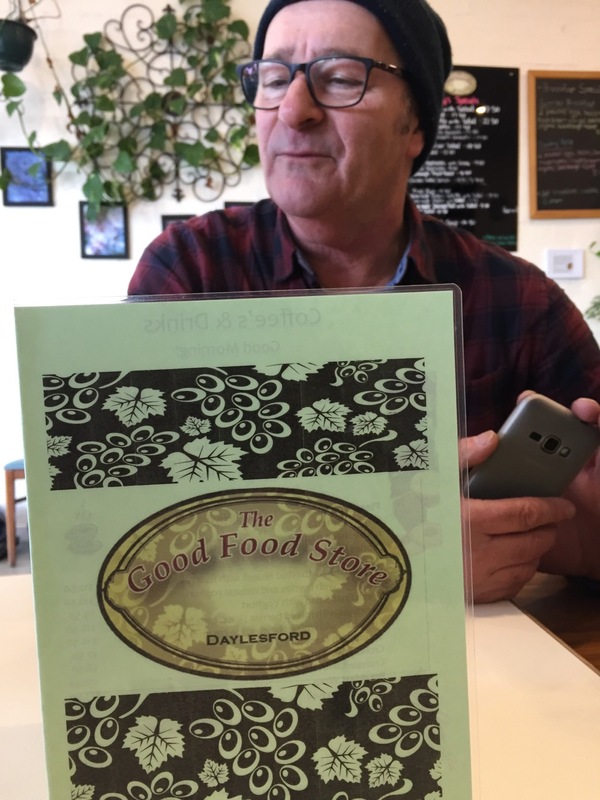 We came into Daylesford and pulled up at the Good Food Store where we have been for breakfast the last few years during the club’s annual Musk Muster. 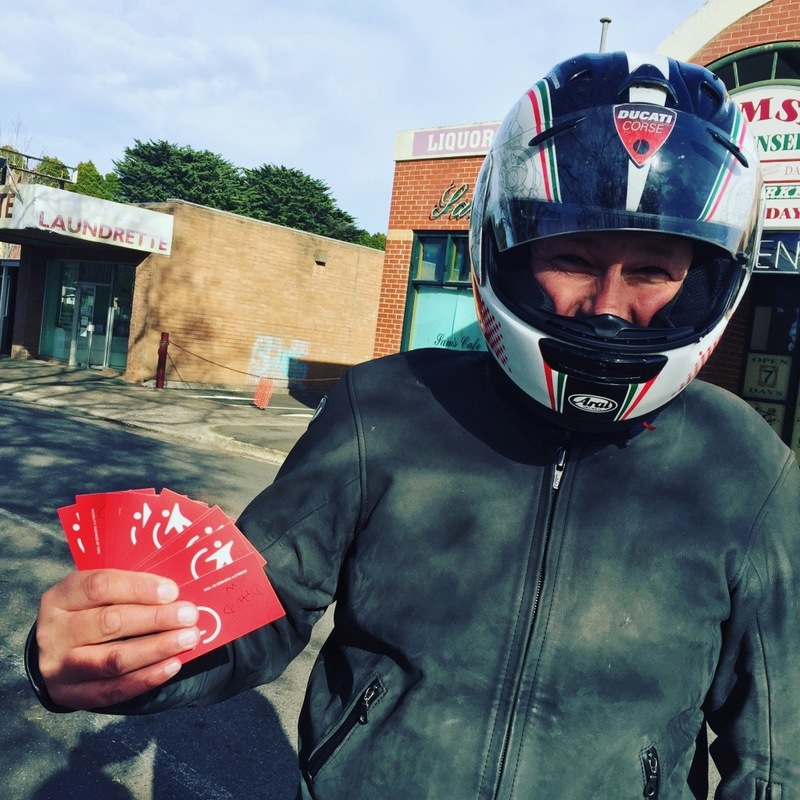 Once seated in the café Peter announced that he would no longer be the ride leader, so out came the cards for a third time. Peter decided that our waiter should choose the next card and Michael V was announced as the next ride leader. 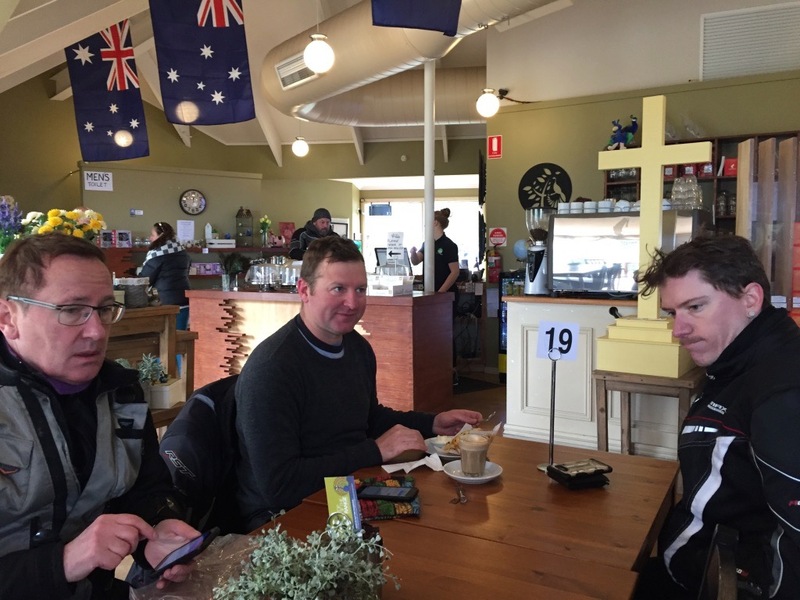 It was after 2pm by the time we finished lunch and Michael decided that given the cold conditions it might be best if the ride heads back to Melbourne. As we inched closer to the big smoke the temperature slowly started to rise, finally reaching double figures for the first time during the day. 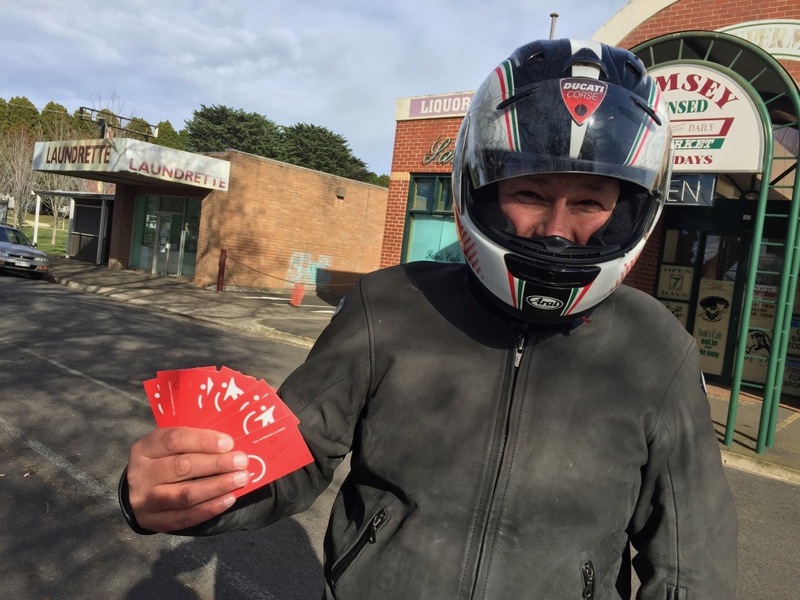 Turning onto the western highway, Michael pulled over at Deer Park and declared the ride was at its end. Not quite 4pm this gave everyone time to get home in daylight and a chance to thaw out before dinner. The Relay Ride concept worked well and was enjoyed by those who attended. So much so I’ve decided to do another one in February during daylight saving so there’s more opportunities for participants to have a chance at leading the ride.